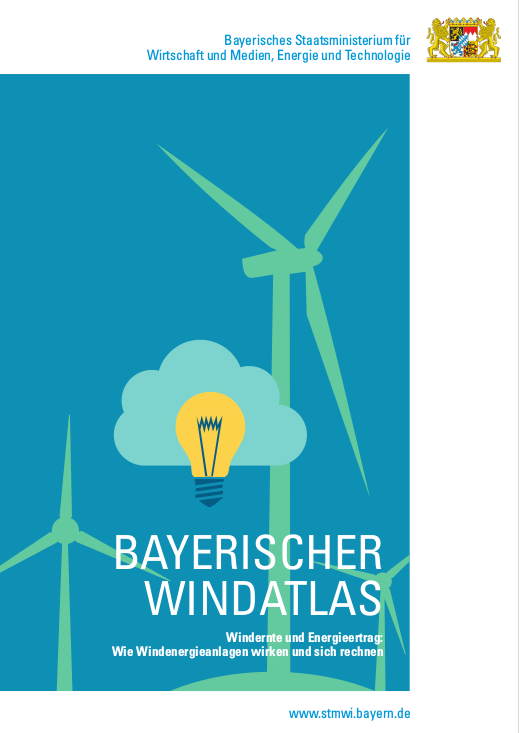 Following a high-level selection process, SANDER + PARTNER has been awarded by the Ministry of Bavaria to prepare a new wind atlas for the state of Bavaria. Bavaria is the largest and southern most state of Germany. Bavaria includes Alpine areas and smooth low-lands between 100m above sea level to Zugspitze, the highest German mountain with 2962 m.
The Wind Atlas of Bavaria includes maps showing wind speed at 10m, 100m, 130m and 160m and maps showing the wind potential of a wind turbine. The detailed maps are based on three-dimensional, meteorological models with a resolution of 200 m only. Moreover, the models re-constructed the wind conditions of the last 30 years. For the first time ever, the Wind Atlas of Bavaria includes a wind data base which shows the annual wind index for the years 1981 until 2012. For a detailed description of the Wind Atlas (PDF), please click here. SANDER + PARTNER provides services at the cutting edge between science and industrial needs. We provide consultancy services with focus on renewable energies, climate change and other topics related to met-ocean applications. Our services are asked by clients in the financing industries, banks, devloppers of re-newable energies and ministries around the World. This text and the pictures are property of SANDER + PARTNER. Please send us a note and we will be pleased to place our property at your disposal.